It doesn't seem that long ago we were here before ....it wasn't , in fact it's less than a couple of weeks ago .....the Lake District kinda gets under your skin ! 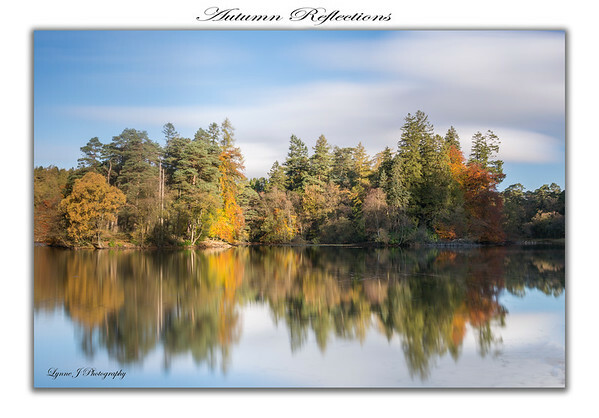 The appeal this time is the Autumn colors and the plan is to visit a new spot , lured by the information in the Photographers Guide to the Lake District . Andy & I both had new tents to try out & being the daft pair we are tonight was going to be the trial run....any normal person would have at least opened the tent bag up to check everything was in order before heading off for a wild camp ! 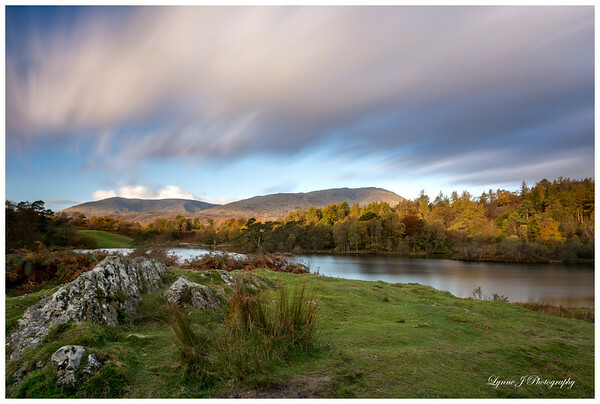 Tarn Hows is the destination , a large man made Tarn just above Coniston , by all accounts a very popular place with walkers & photographers & managed by the National Trust . Running late as usual , the traffic was a nightmare on at A1 which held me up even more , I finally arrived at Andy's around 1.30pm . As is the norm, Andy had packed enough for a week & I swear the car groaned as we loaded it in to the tailgate ! We chatted non stop on the way up , praying for good weather ( the forecast looked promising ) & Andy gave me tips on photographing the Milky Way which was the plan for after sunset . 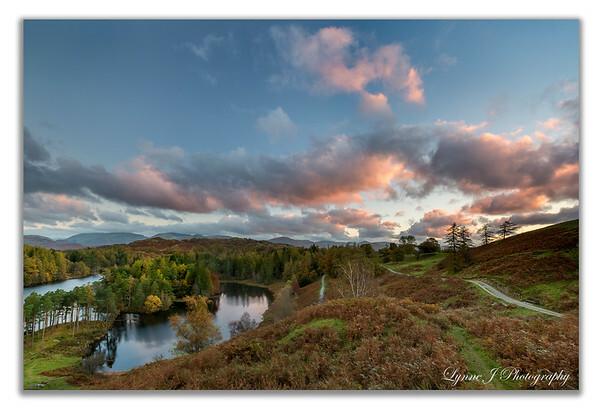 The road through Windermere & on to Tarn Hows was lined with tree's not quite fully in their autumn clothes but with just enough color to give hope of getting the photo's we wanted . We arrived at the Tarn a little after 4.30pm and parked in the main NT carpark along with a 1/2 dozen other cars . From studying the area we had a good idea of where needed to be so backpacks on & car locked we headed off, back up the road we'd just driven down . We followed the well worn path toward the rocks that allowed for views right across the tarn to the distant hills , boggy underfoot in places so some care was needed . The views were stunning in every direction ! The clouds were making wonderful patterns but hanging heavy over the far peaks so ever hopeful we set up the cameras & tripods in anticipation of sunset . Andy wandered off to scout for a likely spot to camp whilst I looked for a composition I was happy with....I struggle with large vistas so took my time , trying different angles until I found something I was reasonably happy with . The clouds above the hill behind me started to glow, typically the ones in front of me over the tree's & Tarn did not but still , just being there was enough . 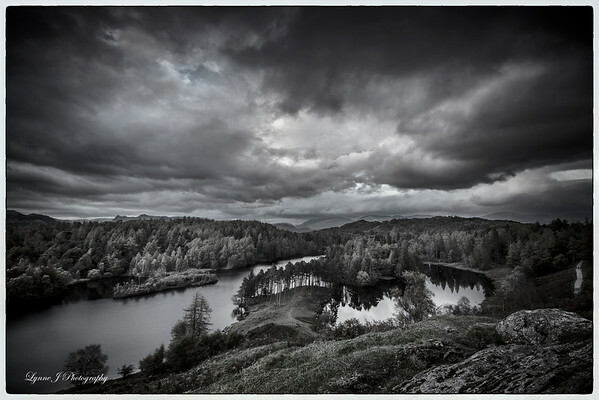 I took the image below simply for the cloud formations & knew it would well as a mono conversion . A few noisey folk passed on the path below just before sunset but that aside the place was peaceful and quiet . A half hour after sunset we decided to go find a place to pitch the tents , the area we'd originally considered proved to be too boggy so we set off along the path back toward to the car then climbed up though the woods to a large field & went in to the woods at the other side. We quickly decided that wasn't going to work as nowhere was flat enough so an about turn & back to the field . A quick natter & we decided this was the place , reasonably flat & fairly well hidden from the path , there were a few sheep about but we doubted they'd cause any problems . By this time it was dark and being the sensible types that we are , neither of us had done a trial run of putting the tents up....this was either going to be easy peasey or end in tears ! With a little help from Andy I managed to figure it out & inside 15 mins both tents were up & looking reasonably good , OEX PHOXX 1 are the tents we had gone for as they are lightweight , pack really small & were incredibly cheap ....ideal for 1 night ( 2 at a push) of wild camping . Next on the agenda was a brew & some food after which we headed off to find a location for some nightime photography .The sky had cleared of clouds and filled with a million stars and right above us we could clearly see the Milkyway ( though I needed a bit of help to see it initially !) . 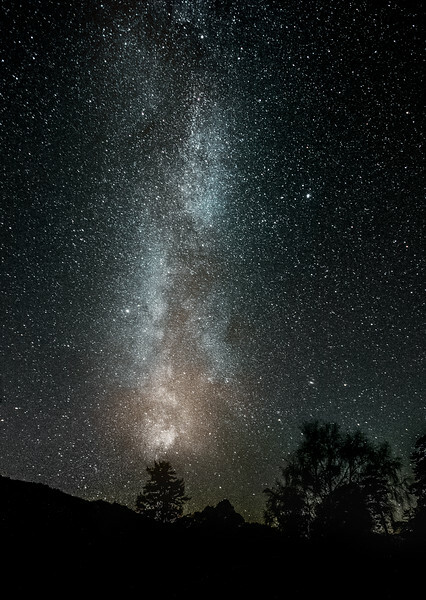 The sky was just amazing.....if you take nothing else from this write up please just take this.........Make time to look up at the sky , see the clouds in all their wonderful formations & look at the stars , it is truly a wonderful world we live in . We walked back down to the main path around the Tarn & found a spot that looked good, the path acting as a leadline to the gate & trees beyond with the Milkway above . I've never done this type of photography so relied on Andy for advice on camera settings such as ISO - 8000 was a bit scary as the D7200 doesn't seem to handle high ISO too well , focus on a bright star in live view ( not happening with the D7200 in any way!) so I focused to infinity, lens stopped down to wide open ( f4 in my case with a 10-20mm sigma) point the camera in vaguely the right direction & go for a 30 second exposure . Add in a bit of light painting on the foreground & some 7 or 8 shots later I was reasonably happy with the results . By this time it was fast approaching 11pm so we moved back up the hillside to the top carpark for a few more shots & while Andy was doing some star trails I sat on a rock & just looked up at the night sky.....& saw my 1st ever shooting star . When called it a night when the clouds started to roll back in covering the stars & set off back to the tents & promptly got lost ! We finally found the tents right where we'd left them ! A quick brew then in to the tents to get some kip ready for sunrise . The OEX PHOXX tents are snug & getting undressed and in to the sleeping bags proved a bit of a battle but as with most things , practice will make perfect , we just need a few more trips . The alarm went off far too soon , 6am to be precise & I listened for noises from Andy's tent to figure out if he was awake as well......no noises so I hit the snooze button for 5 extra minutes . Eventually we both managed to get dressed inside the tents & ventured outside where the 1st priority was to put the kettle on , gotta start the day with a cuppa and a pot of porridge. We headed back down the path to the same spot we'd been at last night ready & hopefully for a great sunrise . I stayed up high, determined to get to grips with large vistas whilst Andy headed down to the waters edge . After 30 mins or so the sun started to color the dawn skies , the clouds behind me glowing subtle pink & yellow, the sky to the left of me started to turn beautiful pastel shades , it was happening finally & I took a couple of shots . 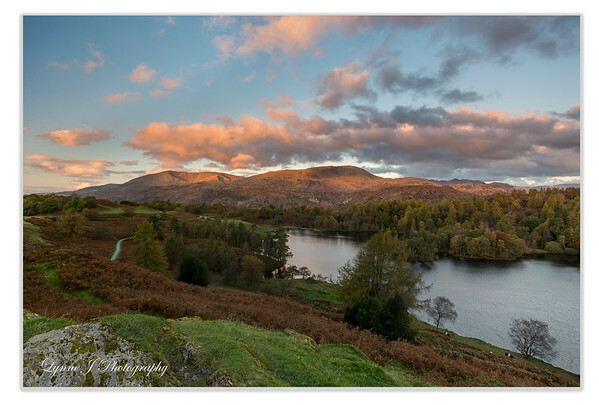 I was waiting for the light to hit the trees at the far side of the Tarn but it didn't really happen but I caught the light just touching the hill tops to the left & some wonderful color in the clouds to my right so I was a happy bunny . Yet again, with such a beautiful morning it was surprising to be the only ones out and about . 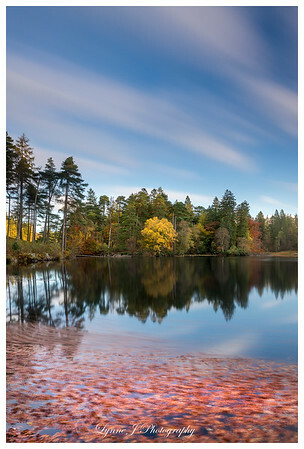 I reluctantly packed up & headed down the slope, over a fence & joined Andy at the waters edge to try some long exposures across the Tarn .The water was flat calm with wonderful reflections ( have I mentioned I'm quite partial to reflections ?) and the clouds were scudding across the sky quite nicely which made for perfect long exposure conditions . 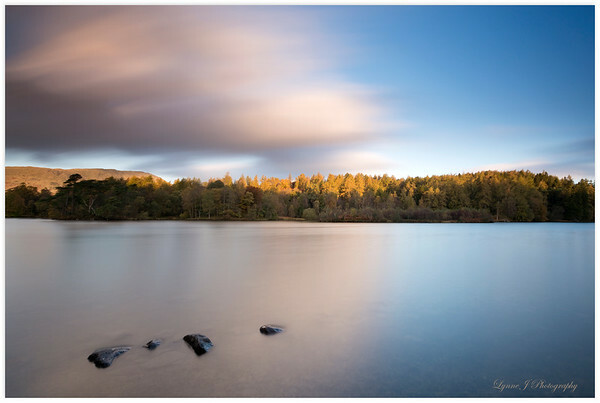 I could quite happily have stayed there all day making the most of the conditions with the Lee Big Stopper & polariser ! I dragged myself away when Andy shouted about some cracking foreground then went off for a wander around the far side to see what opportunities I could find . Amazingley enough we were still the only ones around . Around the edge of the water red leaves were pooled , moving gently in the slight breeze , on the far bank a small tree smothered in yellow foliage glowed in the sunlight, the clouds above were still racing across the sky and I couldn't resist taking a shot before wandering off further round the Tarn . I spotted what looked like a a large piece of a tree semi submerged about 1/2 way along the waters edge so headed toward it hoping to use it as foreground interest whilst shooting across the water to the trees beyond which we were covered in gorgeous yellow & red leaves . There was no clear path through the heather and bracken and I discovered why as I sank several inches in to mud & water , not good when only wearing walking boots as opposed to wellies ! I tried several routes but none got me close to where I wanted to be so I settled on an area that was reasonably firm underfoot and with the 17-55mm Nikkor lens took a shot of the trees just as the sun started to light them up . Time was marching on so I picked my way back across the boggy ground to find Andy and head back to the car , we had no real plans but needed to be at our respective home at a semi sensible time , I had ironing & shopping to do before work on monday . The weather was still pretty perfect and neither of us really wanted to go home so took a quick detour down to Coniston water to see what opportunities were around at Brandlehowe jetty . The water was choppy and there were a few other folk around plus boats so after a few minutes discussion we decided it would be fun to head home via Malham, it was kinda on the way and if the weather stayed as it was , the lone tree would make a perfect subject . Given that we didn't stop talking & planning future meets the journey passed quickly and we added a quick detour to Scarsdale Scar to check out the water fall . Beautiful though it was we didn't stay long , just a couple of record snaps and then back to the car to find the tree before the clouds disappeared . 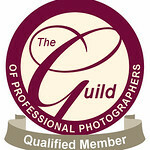 We arrived to find just one other photographer there , he was on holiday and heading toward the Lake District and like us, had decided conditions were so good it would've been daft not stop off here. 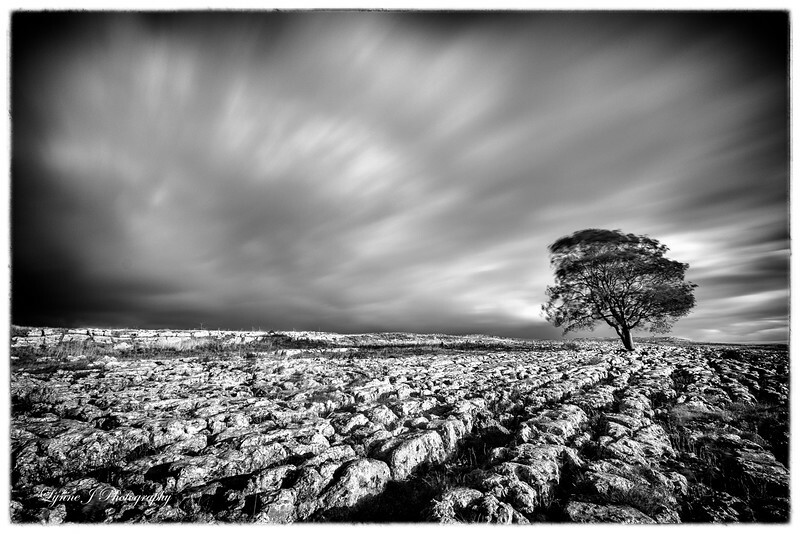 The Lone Tree in question is probably one of the most photographed subjects in the Malham area but every image is different . Never let the " it's be done a million times before " brigade stop you from taking a shot , your image will unique to you and that's all that matters . I tried a few compositions , settled on one with the limestone pavement leading your eye to the tree , slotted in the Lee big stopper and pressed the cable release whilst trying to shelter the camera & tripod from the wind which was gathering strength . The trip was over , we'd had some fantastic weather , explored some new places , got some great images and had a laugh along the way , life just doesn't get much better....looking forward to the next one .